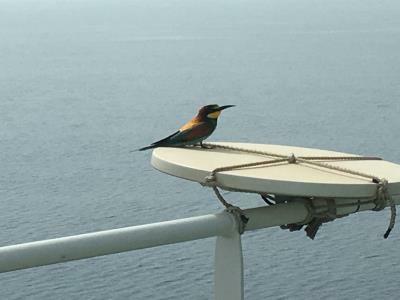 Beautiful Bird Spotted on My Vessel in Northern Red Sea (Today 5th May 2018), close to Sharma.. Saudi Arabia..(Possibly Migrating). 160 It's a European Bee-eater. Taking a well deserved rest no doubt. A very beautiful bird indeed.